in-situ TEM-SPM holder modified Nanofactory version. PXI digital multimeter card (PXI-4071) with picoamps range. Copper wire 0.25mm in diameter. 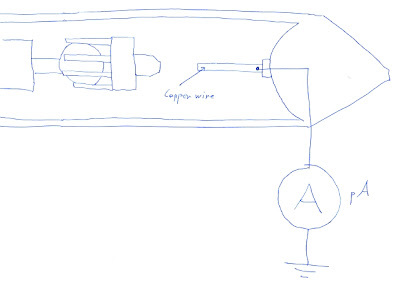 You replace the sample wire in the sample holder as the sketch below shows. Use of light weight metal wire is crucial to minimize electron back scattering. For copper it is around 30% of the electrons that are scattered and therefore will not contribute to the measurement so therefore you need to compensate for this. Besides this it should be straight forward from here on. The highest measured beam-current was in my case 909 pA at 30kX magnification, spot size 1, condenser aperture 120 um. Current is depending on filament power, spot-size (C1), magnification, and condenser aperture. (normal operating conditions) Below is the measurement data table. Schematics: using the in-situ TEM probe for beam-current measurement. "You can measure the beam current with a picoammeter in the earth line"
"You can calibrate the Faraday cup measurement against the TEM screen exposure meter"
"The beam current is usually in the range of nanoamps to picoamps." "If you don't have a Faraday cup, it is possible to get a approximate reading on the current by just measuring the current through a insulated line from a bulk region of the specimen and correcting for electron backscatter. Backscattering is independent of accelerating voltage and aproximately linear with atomic number up to about Z = 30. For example backscatter coeficent for Cu is about 0.3 and for Al it is about 0.15." p.79 "To measure the beam size in TEM/STEM you must form a image of the beam on the TEM viewing screen under conditions where you know, or can calibrate the magnification." -I used the CCD-camera, it's been calibrated previously, to image the beam. I don't considerer the radial intensity distribution of the beam. "A fraction n of the incident electrons can leave the specimen as backscattered electrons (BSE)...n is known as the backscattering coefficient." I really had a great time stopping by your site, it gives me a lot of information. You can also visit my site, thank you! These experts pack the merchandise safely and move them to the new place through a major lorry. The materials that these specialist organizations use to pack customer's merchandise are all of high caliber. I have started the in-situ TEM blog to test new ways of communications. I write posts in subjects of technical and scientific developments made here at the transmission electron microscopy lab at Mid Sweden University. I have a twitter account m_hummelgard and I also exist on Facebook. Please, feel free to comment as you wish on any blog-posts.